Westfield Football Club picked up a tremendous point away to the unbeaten league leaders despite playing with 10 men for 80 minutes. 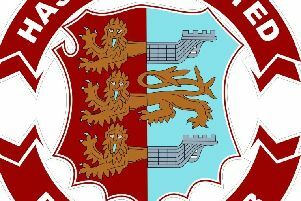 The Westies drew 2-2 away to Southern Combination League Division Two pacesetters Rustington and were only denied victory by a last gasp equaliser from the penalty spot. Westfield chairman and defender Jack Stapley said: “We were fantastic. I know we didn’t win, but I would say that’s the best performance I’ve been involved in, 100 percent. Westfield got off to a bad start, falling behind in only the third minute. The ball was played between away defenders Jack Stapley and Jamie Bell, and Chris Darwin got goalside of Bell before slotting past Jacob Shelton, an outfield player deputising in goal for Westfield. The visitors suffered a further setback when Rob Higgins was sent-off for uncharacteristically kicking out an opponent after believing he’d been fouled. Although Rustington inevitably enjoyed the lion’s share of possession and had quite a lot of shots, Shelton was only really tested a couple of times. Rustington did hit the crossbar five minutes before half time with a volley from outside the penalty box, but Westfield had a couple of opportunities of their own on the break. Josh Carey was denied by the goalkeeper when through and Steffan Davis went just wide from a corner. Westfield pushed Levonte Johnson a bit higher up the pitch during the second period and it seemed to work as they got more of a hold on the game and fashioned some good chances. Davis could have scored at the far post five minutes after the restart and Johnson rounded the goalkeeper but forced himself wide and ended up finding the side-netting. Westfield duly equalised when a move containing around 10 passes ended with Davis rising above Rustington’s right-back at the far post to head home Johnson’s cross from the right. With confidence rising, Westfield took a shock 2-1 lead in the 89th minute. Rustington’s goalkeeper dwelled on the ball too long, substitute Joao Pedro Bannos tackled him and the ball went straight into the net. But they couldn’t hold on. A Rustington forward cut across Ben Ferguson in the box and went down, and the referee pointed to the spot. Shelton got a hand to Josh Irish’s penalty, but couldn’t keep it out. Westfield: Shelton; May, Stapley, Histed, Bell; Charlton, Higgins, Ferguson; Johnson, Carey (Bannos), Davis. Ninth-placed Westfield will end the month with back-to-back home games, starting against Rottingdean Village this coming Saturday. Kick-off at The Parish Field is 2pm.